An al-Qaeda-linked group led by Algerian militant Mokhtar Belmokhtar says it has merged with another group to take revenge against France for its military campaign in Mali. Belmokhtar's Masked Men Brigade and the Mali-based Movement for Oneness and Jihad in West Africa (Mujao) have formed Al-Murabitoun, a statement said. 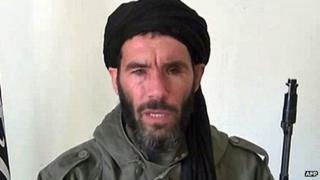 In July, the US offered a $5m (£3.2m) reward for Belmokhtar's capture. He is accused of masterminding a deadly siege at an Algerian plant in January. The US has charged him with hostage-taking, kidnapping and conspiring to use a weapon of mass destruction. Three US citizens were among at least 37 hostages killed when Algerian troops stormed the Tigantourine plant to end the siege. In May, Mujao and Belmokhtar's group jointly carried out twin suicide attacks in Niger on a military camp and a French-run uranium mine, killing 25 people. "Your brothers in Mujao and Al-Mulathameen [Masked Men Brigade] announce their union and fusion in one movement called Al-Murabitoun to unify the ranks of Muslims around the same goal, from the Nile to the Atlantic," the groups said in a statement published by Mauritanian news agency ANI, which is often used by the militants to communicate. Command of Al-Murabitoun, an Arabic phrase meaning "the sentinels", has been ceded to "another personality", the statement added. He is believed to be a non-Algerian jihadi who fought in Afghanistan, ANI reported. The jihadist movement in the region was now "stronger than ever" and it would "rout" France and its allies, the statement said. France led an offensive in January to recapture northern Mali from the militants, who had ruled the north for about eight months after taking advantage of the chaos caused by a coup. They have since retreated to their desert hide-outs and towns and cities are now under the control of Malian and UN troops. A 12,600-strong UN force is being deployed to Mali, as France begins to pull out its 3,000 troops. Belmokhtar was a former leading figure in al-Qaeda in the Islamic Maghreb (AQIM) but he later formed the Masked Men Brigade, which is also known as the Signed-in-Blood Battalion and the Khaled Abu al-Abbas Brigade. Mujao was formed in 2011 to spread jihad across West Africa and it believed to be a well-disciplined group. It is thought to be led by a Mauritanian ethnic Tuareg Ahmed Ould Amer, who goes by the nom de guerre "Ahmed Telmissi", the AFP news agency reports.